One of the things about being a rescue volunteer that would have to go both in the pro and con column is that you learn about a lot of doggie diseases and disorders. Surprisingly, after over a decade, I am still learning new diseases. This week, we brought in a puppy from a shelter who has a disease called Strangles, or Juvenile Cellulitis. Strangles is a condition that usually affects puppies younger than four months of age. Vets don't fully understand what causes puppy strangles, but they believe that it may be at least partly hereditary in origin. Learn more about this mysterious illness, its symptoms and its treatment. Strangles occurs in dogs younger than four months old. It causes inflammation, crusting and pustules of the skin. Vets believe that strangles may have a genetic component in dogs. It occurs most often in Golden Retrievers, Dachshunds and mixes of those breeds. Your vet will need to perform a complete physical exam, and will need your dog's medical history. 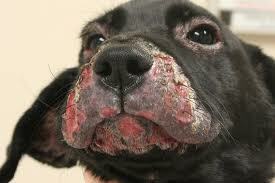 Skin scrapings will be necessary to confirm a diagnosis of strangles. Skin biopsies are also taken. The symptoms of strangles are often similar to those of demodectic mange and allergies. Treatment for puppy strangles usually involves administering a combination of antibiotics and steroid drugs. These medications will need to be administered several times daily. Steroids are used to treat the inflammation associated with the disease, and promote the healing of lesions. Antibiotics help to prevent or treat secondary infections, which can lead to increased scarring and serious complications. You will need to follow your vet's instructions carefully when administering your puppy's medication. When properly treated, puppy strangles usually doesn't come back. However, relapse can occur if medication isn't administered properly. Scarring is a very common complication of puppy strangles. Scars can be extensive and severe. Prevent severe scarring by seeking veterinary care for your puppy right away. Follow your vet's home care instructions carefully, and avoid any aggressive cleaning or topical treatment of your puppy's lesions. While there is no way to prevent puppy strangles, it usually clears up with proper treatment. In most cases, puppy strangles does not come back.